A couple of years ago, Ruger reintroduced their Super Blackhawk Hunter model, which was reviewed here on Gunblast. The Super Blackhawk Hunter proved to be a very accurate revolver that was tailor-made for the handgun hunters, especially those who like to hunt with a scope-sighted revolver. However, as with the introduction of any new revolver, there are some who would like a few changes. 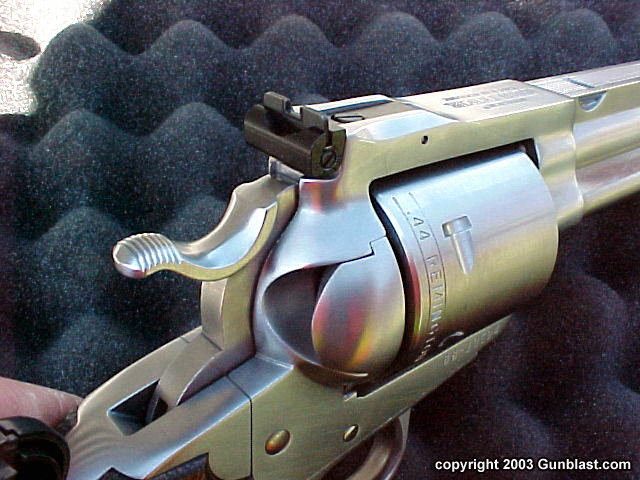 The most common complaint that I received was that many shooters prefer Ruger’s Bisley style grip for heavy recoiling revolvers. Ruger has answered the call with their new Bisley Hunter model. While I find the grip frame of the Super Blackhawk Hunter to be just about perfect, I am in the minority. Most shooters that I know find the Bisley style to be more comfortable when shooting heavy loads. 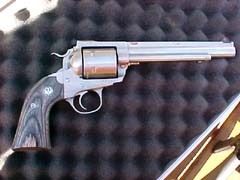 As there are many different sizes and shapes of hands, there are differing preferences for the grip shape on a revolver. 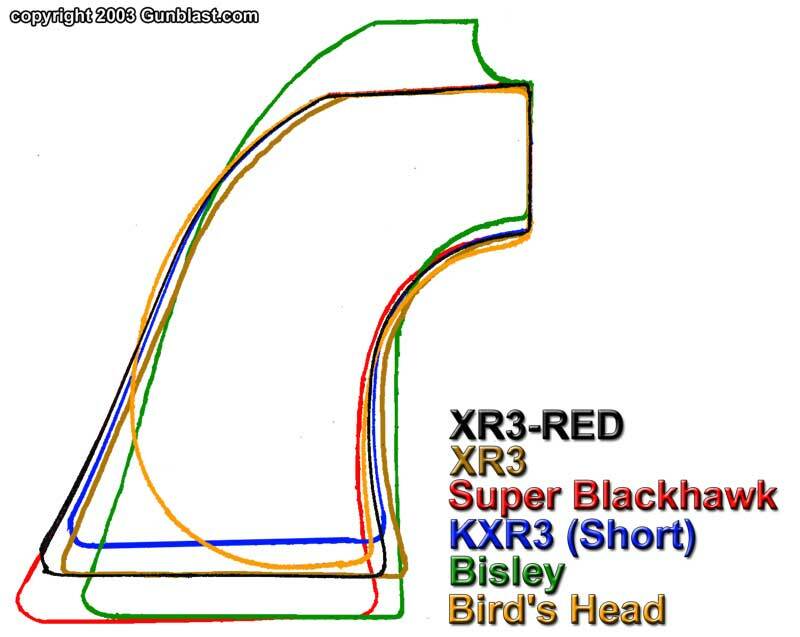 As can be seen in the drawing below, there is a significant difference between the grip of the Super Blackhawk and the Bisley. Other than the grip shape, the Bisley Hunter also has a different style hammer and trigger than the SBH Hunter. 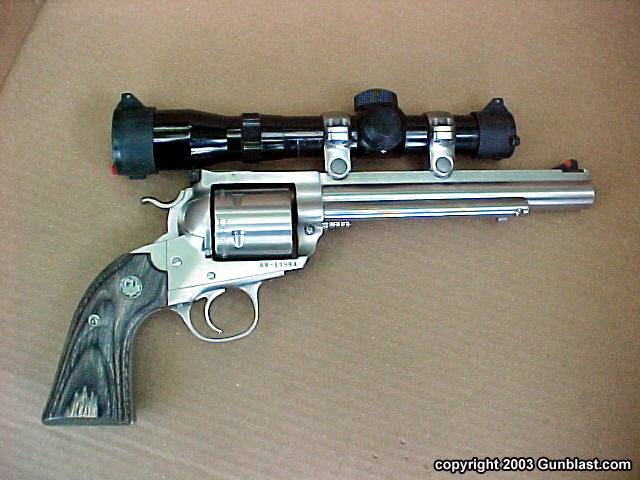 Both guns are supplied with Ruger’s excellent scope mount system that attaches the rings to the heavy rib atop the gun’s seven and one-half inch barrel. Both guns also have Ruger’s adjustable rear sight and interchangeable front sight system. Most of the Bisley Hunter’s design is the same as the SBH Hunter, with the differences being the shape of the grip, hammer, and trigger. The gun received for testing was finished in a brushed stainless, with gray laminated grip panels, just as the SBH Hunter tested earlier. 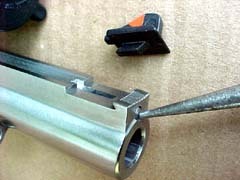 The gun came supplied with a lockable hard plastic case, cable lock, and instruction manual, along with the previously mentioned scope rings. The trigger pull on the Bisley Hunter measured just over five pounds from the factory, but after a quick "Poor Boy's Trigger Job", the pull measured a crisp two and one-half pounds. After mounting a two power Charles Daly scope, the Bisley Hunter was fired using a variety of ammunition, both factory and hand loaded. The sixgun proved to be just as accurate as the previous version, firing several groups at twenty-five yards under the one inch mark. In fact, the largest group fired was just under one and three-quarters of an inch. The best loads were assembled using Mt. Baldy’s 250 grain Keith bullet. This is a premium bullet, cast hard and of the true Keith design. These bullets consistently shot into one-half of an inch at twenty-five yards. 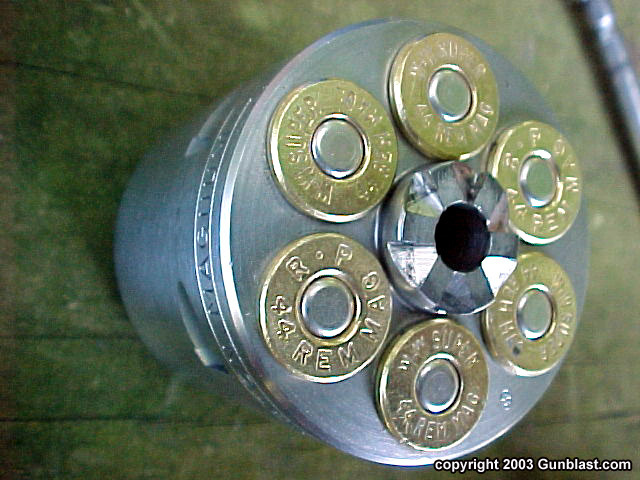 Look for an article soon on these excellent bullets, as I have several different Keith style bullets from Mt. Baldy that I have been shooting. 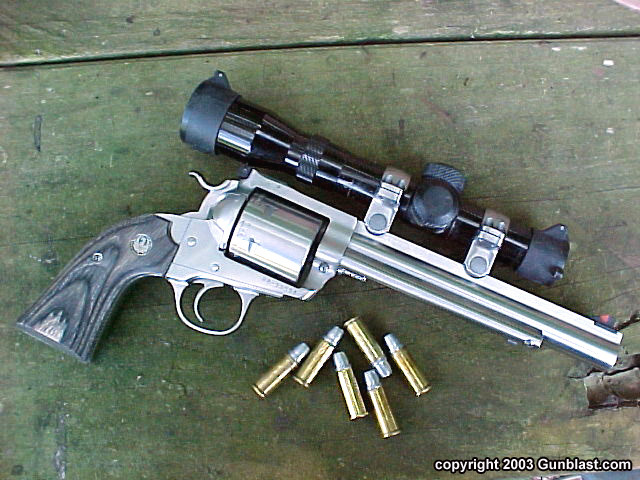 I was greatly impressed with the accuracy of this revolver with all ammunition tested. For a sturdy, affordable, and very accurate .44 magnum for hunting, it will be hard to beat this new Bisley Hunter from Ruger. 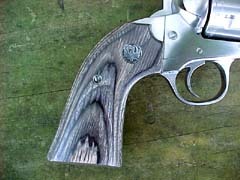 It takes all of the fine qualities of the Super Blackhawk Hunter and adds the unique Ruger Bisley grip for those who prefer its handling qualities. For complete specifications and list prices on Ruger products, click here. For more information on Mt. Baldy Bullets, check them out online at: www.mtbaldybullets.com. Ruger's new Bisley Hunter model takes the proven features of the Super Blackhawk Hunter and adds the Bisley grip frame, hammer and trigger. 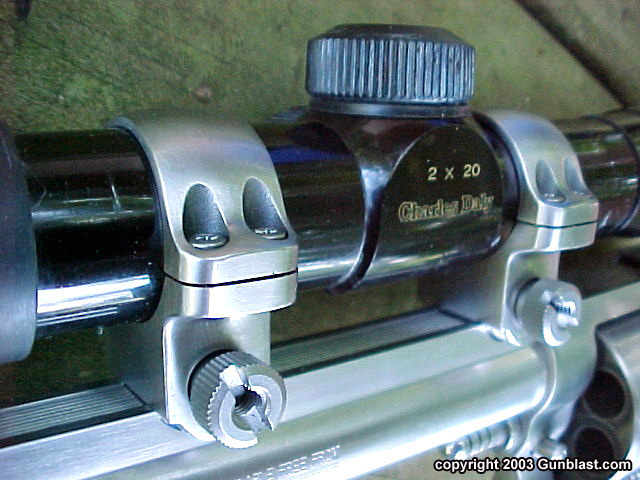 The Bisley Hunter features Ruger's excellent standard rear sight. The Bisley hammer design is lower than other models and allows for easier cocking, especially with a scope mounted. The Bisley Hunter's front sight is the same interchangeable-blade design found on the original Super Blackhawk Hunter. 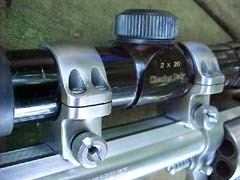 The heart of Ruger's Hunter models is their great scope mount system. Originally introduced on Ruger's Redhawk DA revolver line, this system is strong, quick, easy, unobtrusive, and allows the scope to be removed and reattached without loss of zero. 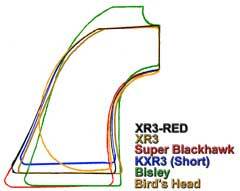 The principal difference between the Bisley Hunter and the earlier Super Blackhawk Hunter is the Bisley grip frame, which is a more vertical design than the Super Blackhawk grip frame. Many shooters prefer the Ruger Bisley grip over all others for heavy-recoiling loads. 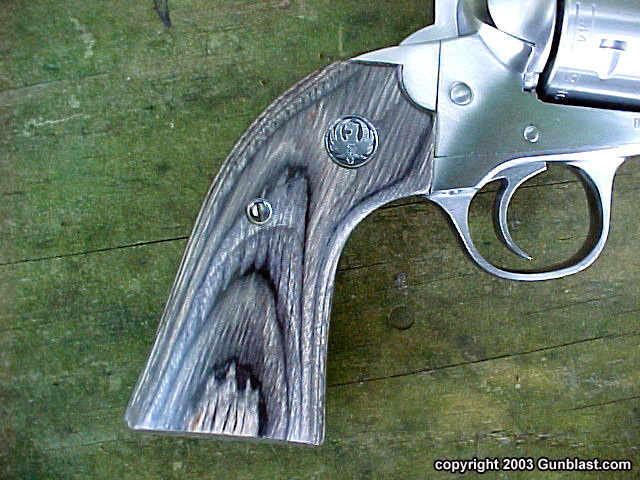 Ruger's Bisley models also feature a rounded trigger guard (rather than the squared Dragoon-style trigger guard of the Super Blackhawk) and a more curved trigger. 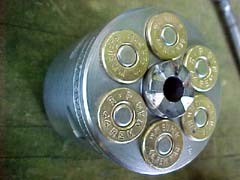 The Bisley Hunter carries a payload of six rounds of .44 Magnum, still among the finest all-around handgun hunting cartridges. 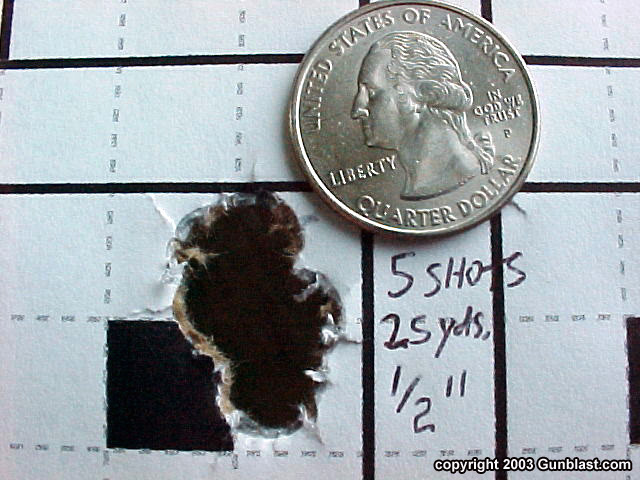 The Ruger Bisley Hunter proved to be very accurate with all loads tested. Author's handloads using Mt. 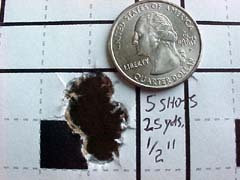 Baldy Bullets' 250-grain Keith offering proved to be the most accurate, consistently putting 5 shots into 1/2" at 25 yards. An accurate, strong and practical hunting machine, the new Bisley Hunter model is a worthy addition to the Ruger legend.